Five-time winner Ronnie O'Sullivan reached the quarter-finals of the World Championship with a 13-5 victory over Matthew Stevens at the Crucible. 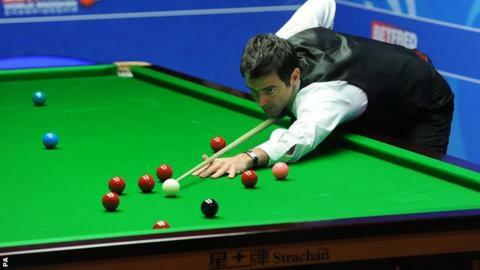 Resuming with a 12-4 lead, O'Sullivan took the frame he needed at the second attempt and faces Stuart Bingham next. Shaun Murphy beat Joe Perry 13-5 to reach the last eight, while Judd Trump defeated Marco Fu 13-8 to set up a match against China's Ding Junhui. Australia's Neil Robertson ended with a 145 break to beat Ali Carter 13-5. With O'Sullivan and Robertson holding such commanding leads, the evening session comprised of just four frames, and took about 40 minutes to complete. Welshman Stevens, runner-up in 2000 and 2005, looked to be struggling with a neck injury in the final session, but still managed to make a break of 63 to reduce the deficit against O'Sullivan. But the damage had been done in the first session and a 77 break saw O'Sullivan, 39, reach the last eight for a 17th time. "I built up a good lead so was happy just to come back for that," he said. "When you have won it five times and won everything, you don't really get that excited. I am just happy to still be playing." Stevens said: "I took a bit of hammering really. I made a couple of mistakes and before you know it he has capitalised on it." Murphy, who completed the 'Triple Crown' of World, UK and Masters titles in January, comfortably beat Perry in their last-16 encounter. The 2005 winner was 12-5 ahead overnight and made a break of 68 to progress to face Anthony McGill in the next round on Tuesday (10:00 BST). With champion Mark Selby exiting from his side of the draw, the Englishman is confident of repeating his feat of 10 years ago, when he won the event as a qualifier. "I am playing the best snooker of my life," said the 32-year-old. "Being 12-5 in front is difficult to approach but I tried to prepare in exactly the same way as I would normally do and hope I got the chance to get over the line." Perry said: "Shaun is a great front-runner and I never recovered from a bad start. The game can turn around, but at 7-1 you are just trying to get some pride and make it respectable." Trump, beaten in the 2011 final by John Higgins, showed no nerves when close to the winning line against Hong Kong's Fu, stroking in a superb 133 break to advance. "If I continue playing like that I will be tough to beat," said Trump, 25. "My game is there, it is just whether I can keep it up for the rest of the tournament." Robertson compiled a stunning 145 break - the highest of the tournament - to beat Englishman Carter and faces Barry Hawkins next. It was his fourth century in a match he dominated. "Comebacks have happened before but being 10-3 up, I wanted to win with a session to spare. An 11-5 lead I was happy with though," said Robertson. "Someone will need to make a 147 to beat my high break now, and I am very pleased to win the match."